I don’t want to jinx myself, but I think this will be my third, and last, summer working in the library! Hurray! I have the library management system I’ve always wanted (Follett Destiny) and I’m purging my way through the books in the collection. With a little hard work, I should have the library where I envisioned it four (!!) years ago. Each year I get more aggressive and demand more from the library. At first, I was happy to have the books sort-of grouped by genre, which was a controversial move on its own. In fact, I can’t believe I was so bold to go in there my first year and move everything around like that, as a volunteer. Last year, I started purging. I focused on getting rid of anything ridiculously out of date, like the many sets of encyclopedias from the 1960s-1980s. Our former principal requested that I keep the most recent set, so I did. I also donated any book without a dust jacket, which was an alarming amount. I figured out that a librarian from many moons ago decided to save money (or time) wrapping hardcovers by just removing the dust jacket from the book. Brilliant! Such a shame you can’t tell what the book is about without the dust jacket. This year, I’m waging a full-on organization war. I have to enter in every book in the library into the new system anyway, so I figured this was my time to really and truly cull the collection. I used to keep many books I�should have donated because I was afraid to get rid of something or the shelves looking bare (or getting in trouble), but as I bought more books and became better at asking for donations, I quickly realized that space is at a premium in our small library. I don’t have room for four copies of the Junie B. Jones and Magic Treehouse series. I especially don’t have room for Clare Darcy’s Elyza, a regency romance about a tomboy who gets caught up in London society. Elyza could be the most charming book ever written, but�I can’t keep a book that was last check out in May of 1994. Here’s a lousy picture of what I hope will be an amazing outcome. I narrowed the genres down to 14, and each one has its own color. 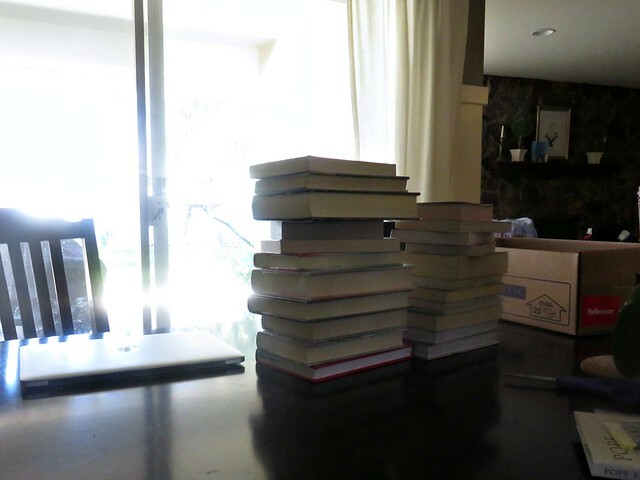 This is the first batch of books I finished a few weeks ago. I have a few shelves completed�now. The�young adult section for the 7th and 8th grades will look the same, with the addition of call numbers that start with YA. 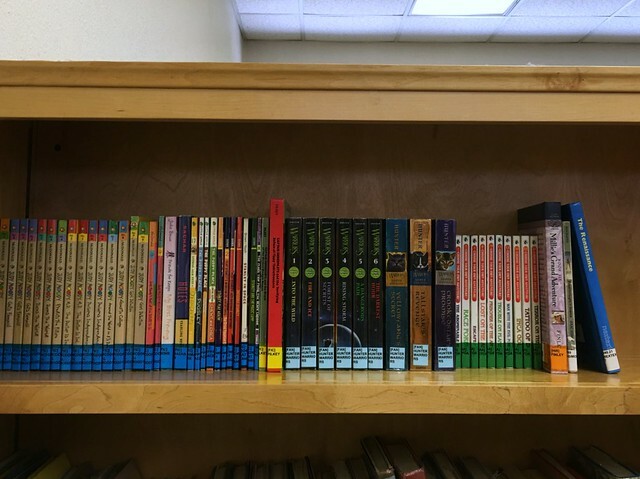 �Now, when a student wants to find an action adventure book, they know to look for a green label. General fiction is blue, humor is yellow, and so on. It should help kids self select better and expose them to books they may have otherwise ignored. It’s not a perfect system, but each stumbling block has a solution. At first I agonized a bit about separating an author’s body of work (Kate DiCamillo�and Avi�will be all over the library) but then I realized it was a perfect opportunity to encourage the students�to avoid ruts and try something new. If Kate DiCamillo can’t bear to write only fantasy, students�shouldn’t aim to read only fantasy. I might have to turn this into a scavenger hunt/reading challenge, where the winner figures out which author has the most diverse output. Between culling, data entry, wrapping, and affixing labels, each shelf takes me about two hours. I have somewhere between 40-50 shelves left to go. I stopped counting after 40 on Friday because I was feeling very, very discouraged.�But, that was before I timed myself this weekend, and�knowing how to calculate the length of this project is making me feel much more optimistic. I’m going to be back tomorrow with the final count of shelves left and more progress pictures.